Kastalia Medrano of the online magazine Inverse recently interviewed me about the relationship of Marvel’s upcoming Thor: Ragnarok movie to the original Norse mythology. 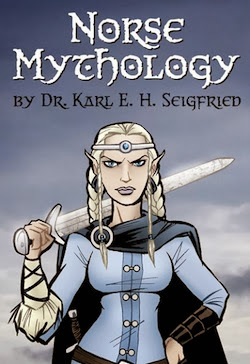 Since the brief article she wrote based on my comments largely consisted of paraphrasing my answers, she has kindly allowed me to post her questions (in bold) and my full answers here on The Norse Mythology Blog. Is there a period where Thor is shirking the responsibility of his rightful throne and is simply wandering around being self-destructive/attempting to be anonymous? Nope. In the major Norse myths that survive, which mainly come from the two 13th-century Icelandic texts known as the Eddas, Odin is the ruler of the gods. He has been ruler since he and his two brothers killed the first Frost Giant and made our world from the massive corpse. He will be the ruler until the destruction of this world at Ragnarök. At that point [SPOILER ALERT], Odin dies, Thor dies, everybody dies. Well, not everybody. Two humans survive the cataclysmic battle by hiding inside the World Tree, the god Baldr returns from the world of the dead, and a few assorted secondary gods and sons of gods rule over the new world that rises up from the ruins of the old. So, there is never any idea that Thor is a young prince who will someday inherit the throne of Odin. That courtly sort of plot was imported into the mythology by Stan Lee and Jack Kirby, who created the pop culture version of Thor for Marvel Comics in the 1960s. They also imported a whole bunch of other stuff that has nothing to do with the original myths, like Loki being Thor’s adopted brother, Thor having to prove he’s worthy, and Thor’s hammer Mjölnir being so heavy that only he can lift it. Interestingly, the things that a lot of people think are the core of the Thor mythology are the exact things that were made up from whole cloth by Lee and Kirby. There is evidence that Thor was worshiped as the central god in some areas, such as at the pagan temple of 11th-century Uppsala, Sweden. We don’t have mythic narratives of him in such a role, however – just a brief description of the imagery and rituals of the temple. We have Icelandic narratives of Thor wandering around, but he’s definitely being destructive of others, not of himself. His main pastime (aside from eating and drinking prodigious amounts) is smiting giants. He does disguise himself as a young boy in one tale, but that’s just so he can further his mission to destroy his nemesis, the mighty World Serpent. I wouldn’t say Thor’s destructive adventures are shirking his responsibilities, because he’s defined by his role of protecting the worlds of gods and humans from the giants, who would overrun us all if given a chance. That’s why the business in the first movie about Thor sneaking off to Jötunheim (“World of the Giants”) to smite Frost Giants against the wishes of Odin makes no sense. In the myths, that’s what he does for a living. Does Thor fall in love with a human woman? Nope. That’s another thing made up by Stan Lee and Jack Kirby. In the early 1960s, Marvel Comics grew out of Atlas Comics, which had published in a wide variety of genres, including medieval, science fiction, romance, and monsters. The genius of Lee and Kirby was to combine all these strands into one title. They relocated a deity from medieval Icelandic mythology to a futuristic world of gods in outer space, then brought him to earth to protect his love interest from monsters. Now Disney owns Marvel and keeps the genre-mixing formula going in its movies and TV shows. It’s fantastic stuff. It simply has very little to do with the original mythology. Does anyone ever take his hammer? Is the theft related to the Ragnarök or Doomsday aspect? Thor wakes up, gropes around under the sheets, and notices his hammer’s missing. Paging Dr. Freud! He turns to Loki and says his hammer’s been stolen. Yes, he turns to Loki after he wakes up, not to his wife Sif. Hmm. Loki borrows the goddess Freya’s magic cloak of falcon feathers so he can fly to Jötunheim and look for the hammer. He finds out that a randy giant named Thrym has hidden the hammer underground and won’t return it until Freya marries him. Thor cares less about Freya’s consent than he does about feeling his hammer’s shaft back in his hand again, so he tells her he’s taking her to get married to the giant. She furiously replies that only “the most man-mad of women” would do such a thing, and she absolutely refuses to go. 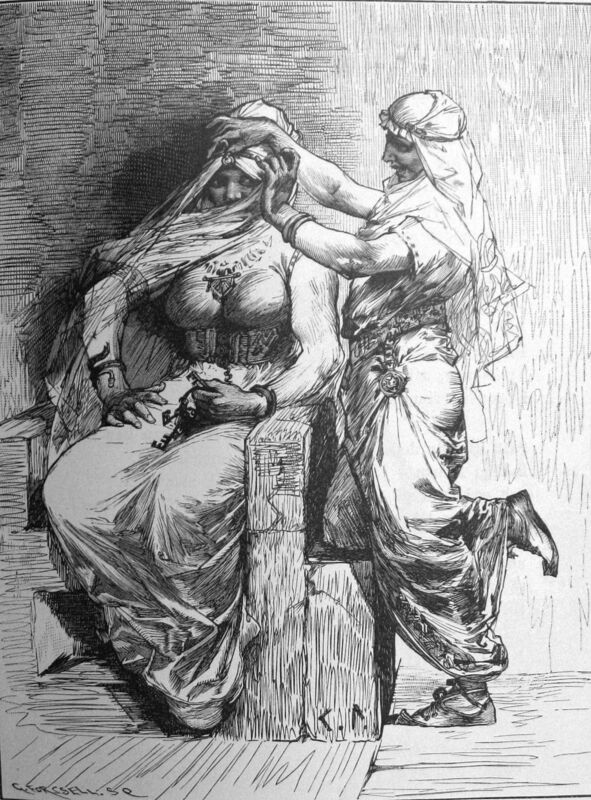 The gods meet together in council, and Heimdall comes up with the idea of dressing Thor in drag and sending him off as the bride. The extremely manly Thor is horrified by the idea (especially after Freya’s comment about being “man-mad”) and is convinced everyone will think he’s argr – an Old Norse word meaning everything unmanly, from unseemly sexual behavior to rank cowardice. Loki tells him to shut up and put on the bridal gown. In the myths, Loki changes gender and species and, at one memorable point, seduces a stallion and gets pregnant. Here, he happily dresses himself as Thor’s bridesmaid. When the giant leans forward to lift the veil and kiss his bride, he’s terrified by Thor’s burning eyes. Loki says, “Freya did not sleep for eight nights, so madly eager was she to come to Jötunheim.” Of course, Loki repeatedly telling Thor’s greatest enemies that s/he is “madly eager” does nothing to lift his mood of impotent rage. As soon as the hammer is in his lap, Thor feels his old manly self again. 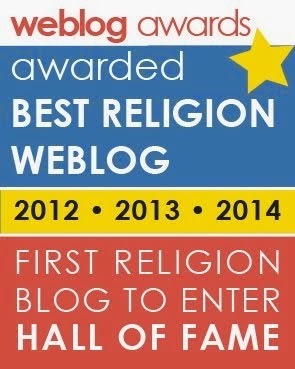 Dr. Freud, did you get our page? He immediately goes back to doing what he does best, and what he does isn’t very nice. He kills the giant, smites his sister, and demolishes all the giants – a red wedding centuries before Game of Thrones. What is all this? The poem is the funniest one in the collection we now call the Poetic Edda, and it really does seem like it’s about the manliest of the gods having a bout of impotence. This is not unheard of in Indo-European mythology, the wider transcultural system to which the Norse myths belong. Thor’s Indian counterpart Indra at one point gets castrated by an angry cuckold and has to replace his missing bits with ram’s testicles. 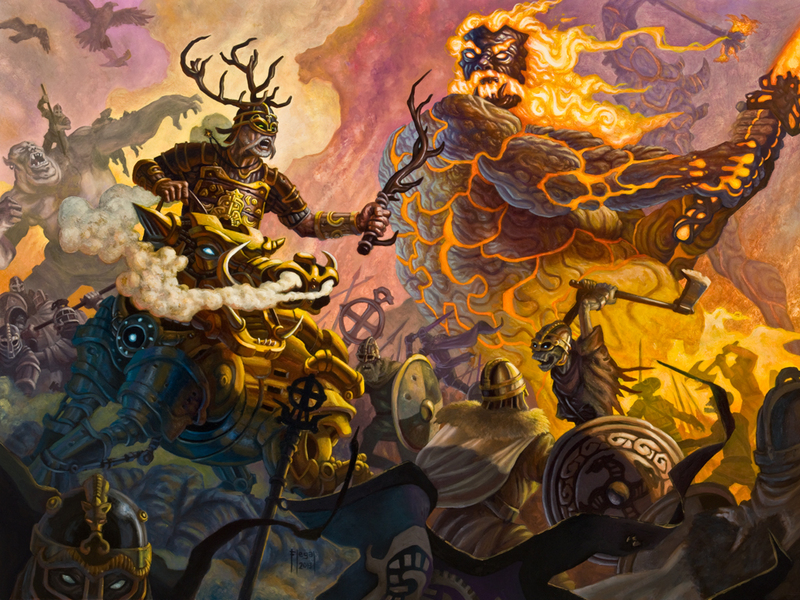 Throughout the Indo-European myths, there’s an idea that gods must sacrifice what is most important to them in order to gain the cosmic power of exactly that thing. Odin gives up an eye in order to have second sight. 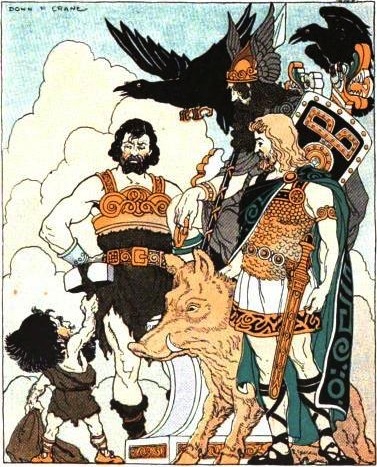 Tyr gives up a hand in order to join men’s hand in compact. 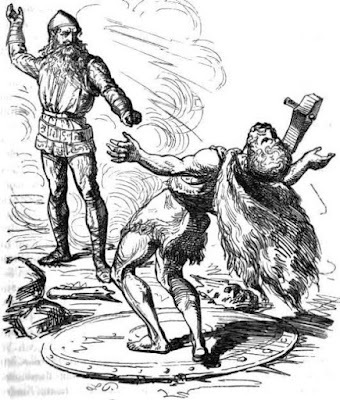 Baldr gives up his life in order to survive Ragnarök. Thor, the manliest of the gods, must give up his phallic hammer in order to have the ability to become more potent than the giants. Narratively, the giants try to steal the women of the gods’ tribe; symbolically, they represent the uncontrolled forces of nature that seek to overwhelm the land of the human tribe. By losing his hammer from his wife-less bed and going through the humiliation of becoming a bride himself, Thor gains the ability to reign/rain over the fields of men, bringing fertility as he showers down the life-giving emissions from his mighty hammer. So, the sexual innuendos of the poem serve a larger cosmological point. However, the whole narrative really takes place at the other end of the mythic timeline from Ragnarök. Can you elaborate a little on what powers the hammer gives him? The powers of Thor’s hammer are described by the Icelander Snorri Sturluson in his Edda of around 1220. It never breaks and it never misses. The bit about always finding its way back to his hand could be interpreted to mean that Thor will always be able to find it when he goes to look for it after throwing it. Stan Lee and Jack Kirby interpreted it to mean that it magically flies back to his hand like a boomerang. The bit about the hammer shrinking down and being worn inside Thor’s shirt seems like a reference to the Thor’s hammer pendants worn around the neck by pagans of the long ago time and by followers of the modern Norse religion of Ásatrú today. It also could have solved a design issue for Lee and Kirby, since their Thor always has one hand full holding his hammer at all times! Lastly, if you'd like to watch the trailer and just leave any thoughts about its merits, that would be much appreciated. It looks awesome. Disney clearly told Marvel to adapt the Planet Hulk storyline in the style of the Guardians of the Galaxy movie and throw in Thor for added marketing synergy. I’ll bite, since I really enjoyed both of those corporate entertainment products. It has nothing to do with Ragnarök, of course – neither the original mythology nor the way it’s been retold in Marvel Comics over the years. As a comic nerd, I would have preferred to see a true Thor film that tied off the trilogy by following the plot lines set up in the first two movies. I guess that didn’t fit in with Marvel Cinematic Universe Phase Whatever-This-Is. 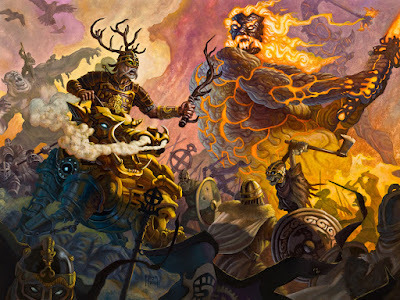 I do hope that someone someday makes a series of movies that’s actually based on Norse mythology itself. There’s more than enough there to make some fantastic films, without having to rejigger it and add a whole bunch of other business. Do you have any thoughts about whether Thor or the Hulk would win in a fight? The Thor of the myths would have had absolutely no problem with the Hulk, since he never has and never will meet a giant he can’t quickly demolish (aside from one who tricks him with magic, but that’s another story). His list of epithets includes names like “killer of Hrungnir, Geirrod, Thrivaldi.” The jolly green giant would be just another notch in Thor’s belt. The Thor of the comics, who knows? His power levels and abilities change from year to year. These days, Disney owns Marvel and issues like this seem to get settled by their market research department, in order to provide fan service to the largest number of potential consumers. The question my nerdy friends and I had as kids in the 1980s was, “If the Hulk got mad enough, could he become strong enough to lift Thor’s hammer?” Life is full of mysteries. Brilliant! Really enjoyed the background. Love this one. It provides great additional summaries of where the Eddas and the Comics differ, but does so in a manner that provides a level of respect to both. WELL DONE!!! Thanks for this really enjoyed it.